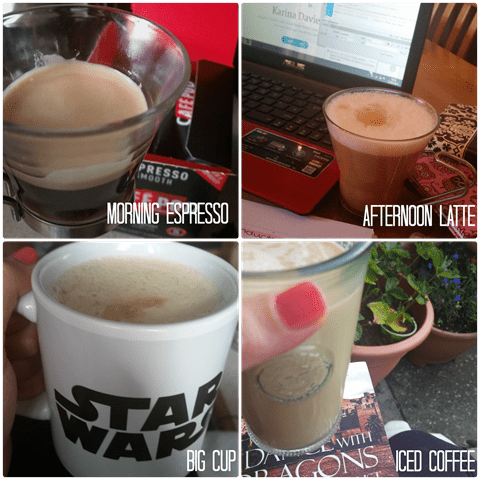 I’ve mentioned before how much I love my Nespresso machine, it’s become a lifeline in our home. Being able to grab a barista quality coffee in a matter of minutes is why the Nespresso Lattissima + has become one of our favourite household appliances. I do enjoy having a cup of coffee in the mornings along with my fruit and muesli, it’s the cup that prepares me for the rest of the day and I particularly look forward to relaxing in the evenings with a cup of coffee after a meal.You may have also read that even though we love our Nespresso machine, there is a downside of only being able to purchase the Nespresso capsules direct from the online store or from one of their high street stores, if I run out it can be a huge pain. I had a look around but was only able to find a few Nespresso compatible capsules, most of which were only available to order online which left me in the same situation of not being able to pick up a pack when at the local supermarket. That was until I heard of CaféPod, we’ve recently been trialling the CaféPod Nespresso compatible pods, I was delighted to discover that they were available from my local Tesco store. 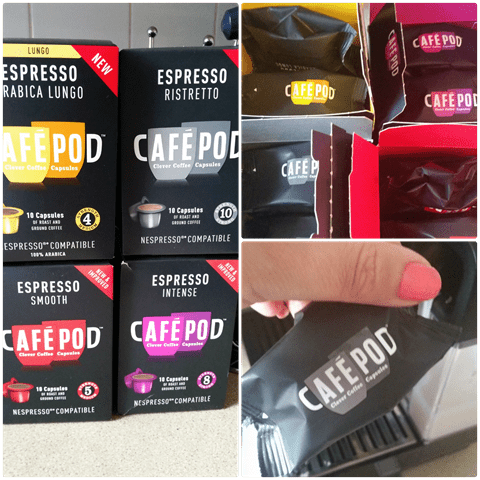 CaféPod have launched a range of capsules that fit in your Nespresso machine, each box contains 10 capsules priced at £2.75. On first inspection, the CaféPod pods/capsules come in individually sealed foil packets, it seemed a little excessive to me and took up a little more storage space. The pods themselves are plastic unlike the Nespresso pods which are aluminium, this however made no difference to the actual end result in my opinion but the hot water did take a a little longer to filter through. I should add here that the pods were just as easy and simple to use as the Nespresso pods, producing a decent coffee in a matter of minutes with just the push of a button. The first pod that I tried was the smooth which has an intensity of 5, it was the perfect coffee for me to start my day with. Just like it’s name, it proved be a very smooth coffee with notes of chocolate and created a rather nice crema, which is just what I look for in an espresso. Next on my list to try was the Intense pod with a higher intensity of 8, this was my afternoon pick me up whilst working. It was a rich, heavy bodied coffee with a hint of dark chocolate. We use a lot of unsweetened almond milk in our household and I was quite surprised that the intense pod complimented the nutty almond milk flavour. After finishing my workload for the afternoon, I took the little one outside to play in sun whilst I grabbed a moment to catch up with my current book over a glass of iced coffee. I chose the Arabica Lungo with an intensity rating of 4 to be the star of my iced coffee for it’s subtle red berry hints and toffee like aroma. It had a slight sweetness to it which really did create quite the delightful iced coffee. Lastly I tried the Ristretto, it was the strongest with an intensity rating of 10 but after a long day a little pick me up was needed as we sat down to relax. I was quite surprised how much I enjoyed the Ristretto, I’m not usually one for such intense coffees but it was rather pleasant with dark chocolate and red berry hints and underlying hints of spice. I can certainly see this being quite a favourable coffee on a cold day in winter. Overall I found the Smooth to be the most versatile pod and it’s smoothness had me returning for a refill more than I should but my favourite pod had to be the Arabica Lungo, this pod had a fantastic aroma and with the lovely warm weather that we have been experiencing lately, it made the most amazing iced coffees. CaféPod capsules are available to buy from Tesco, Waitrose, Ocado and Amazon for £2.75 per box. Disclosure: I was sent a selection of CaféPod coffee capsules to review. All thoughts and words are my own. Previous articleMeet the Super Fruits!